I did a talk for the Oxford Transhumanists yesterday, and Stuart Armstrong filmed it for me: Brain-machine interface part 1 and part 2. The view might be a bit limited (you get to see my slides and occasionally my hand-waving), but it might be of interest to some of you. So people are quite ready to enhance "cold" mental faculties like alertness and language ability, while unwilling to enhance "hot" faculties like empathy and self-confidence. Of course, the framing and means matter a lot (the paper shows this). Many people are willing to undergo a lot of training to improve self-confidence, an improvement that might actually be bad for them. Second, people do not care much about banning the core trait enhancements - a bit odd, since they are likely the ones people would regard as ethically the most problematic. Instead the red quadrant involve enhancements that are perhaps viewed as competitive advantages: the surveyed students did maybe not want more zero-sum competition, but would love to get ahead in it. 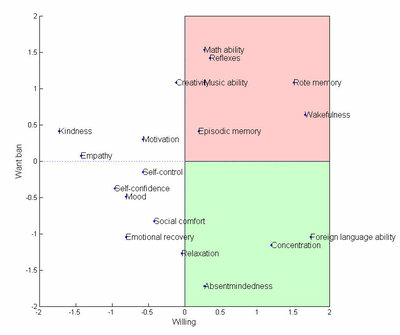 The green quadrant involves a mildly therapeutic enhancement (absentmindedness) and two enhancements that might be seen as good in themselves (concentration and language). But I doubt one can express this as a proper ethical case. 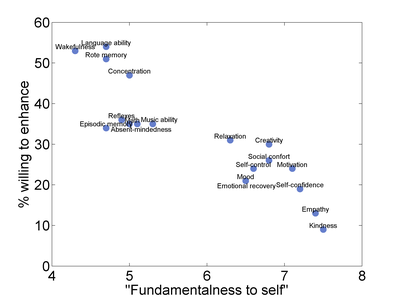 Overall, I like the paper and would love to see more replication. If you are interested in the paper, it can be found here (PDF). My own talk on the feasibility of whole brain emulation can be seen here. I am not too happy with it - I was a bit unprepared for our re-making so I did not have any of my notes to guide me, so be prepared for a slightly confused talk. The paper in the proceedings will be much clearer, trust me.